AAA Metal Suppliers offers balustrading contractors and builders a stylish alternative at competitive prices. The fittings are made from the finest quality prime grade AISI 316 stainless steel and exceed the required loads and/or tensions of the 2006 Building Code. AAA fittings are suitable for both simple domestic applications and major public works projects. We also supply builders with easy to install pre-swaged balustrading kits. Our range of stainless steel fittings includes eyebolts, rigging screws, shackles, hooks, swivels, thimbles, tensioners, eye nuts, turnbuckles, bottlescrews, snap hooks, wire rope, rope grips, glass clamps, stainless chain and pad eyes. We can also supply to order a range of steel rigging fittings. Our website offers online prices and trade discounts are available for commercial quantities. 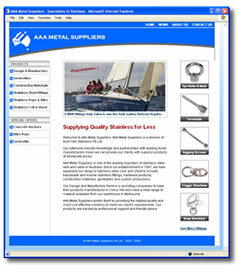 AAA Metals Suppliers prides itself in delivering felxible, reliable and efficient cost-effective service. Supported by an established network of major international partners, we can help you source a wide range of products to ensure the success of your project. Supplier and importer of stainless balustrade fittings, stainless wire and cable, marine fittings, stainless coil, sheet and bar, hardware products and geotextiles for construction projects. Easy to install DIY stainless balustrade kits are available for builders or the home handyman. Australia wide delivery and online prices.